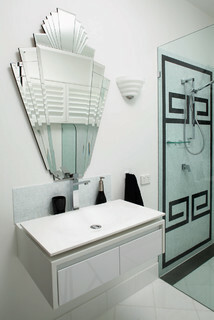 When I say “modern bathroom sink”, I’ll bet you and I conjure up a pretty similar vision of the room in which that sink fits – simple, cold color tones, uninterrupted straight lines, polished chrome highlights. OK modern, we get it! 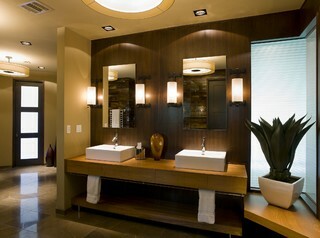 Recently, I’ve been more impressed with a bathroom design that benefits from a little unpredictability. Why not throw that sink somewhere you don’t expect it? If you really dig the look of modern sinks but aren’t interested in converting your entire bathroom to the streamlined, polished look, below is some inspiration to blend the modern sink with a variety of bathroom styles.